Make 1,000 Jam attempts on one track. All of these attempts must take place on a single Jam track. Every time you start or re-start, it counts as an attempt. There must be at least five seconds between each restart! There's also an achievement for 5000 and 10000 attempts. 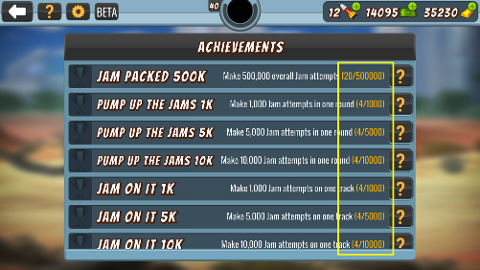 You can see your current counts for attempt-based Jam Achievements on your main list of Achievements.